When you need a promotional product to help market your business to a wider audience, we bet you’ve turned to the typical pens, notepads, USB’s and caps. But have you thought about how wide your audience reach could be with a promotional luggage strap? Yes, those secure straps you put around your luggage when travelling to easily identify your bags and keep them secure are a great promotional tool, and a great way to promote your brand to people who normally wouldn’t know of you. They are practical, easy to use, easily store and have great perceived value. What’s more they are easy to incorporate in any marketing campaign no matter what the theme. These are of course a fantastic promotional item for businesses involved in the travel and hospitality business such as travel agencies, airlines, hotels and any other organisation involved in the tourism industry. They can also be used just as effectively for clothing brands, event and function centres, major department stores (especially those with an online component) and trades based businesses such as mining and construction. In short in is a amazingly adaptable promotional gift. Promotional products are a great way to promote any companies or organisations brand or products. Promotional products are proven to remain in the recipients mind long after they have received them. Luggage straps as a promotional product are an inexpensive way to reach out to customers and build loyalty. Many of our clients also use these printed luggage straps as promotional merchandise, advertising them at their point of sale to their customers. They are often a last minute purchase that your customer would never normally think about buying, and are a great product to upsell. Because luggage straps tend to be bright and bold to make bags easier to identify, and also tend to be rather large, this gives you ample opportunities to market your business. They are the perfect medium for a bright logo and marketing message, and due to the size, you can easily fit in your marketing message without worrying about losing the context. They are easily identified from are large distance by both the user and fellow passengers. Our branded luggage straps come in a range of colours and made of quality materials to ensure they last the rigours of domestic and international travel. We can also produce personalised luggage straps in our range which make great gifts and are fantastic as part of a sporting team kit. Sublimation print – great for multicoloured logos with a gradient. Screen print – suitable for logos up to 4 colours. Woven – Usually one or two colour logo woven into the fabric. In this age of mass travel there is no better way to spread the reach of you brand then the use of luggage straps. Not only will you customer be reminded of your brand when they travel so many other travels will be exposed to your brand during the most pleasurable time of their year. No memory is more enduring then that of our end of year holidays. Custom suitcase Straps are not only a great way to get your business name out there, but they are a handy travel item that will help your customers remember who you are. They are a great way to help your customers and clients easily identify their bag in the airport or train station, and are always well-received. Whether you have staff members who travel a lot on business, or your main business is travellers and tourists, our promotional luggage straps are a great marketing opportunity for you to tap into and get your brand known outside your general marketing area. Custom luggage strap can not only be customised with your logo but also with different available attachments. Not only do you have availability of the standard clip you can also opt to use the combination lock for added security. Also there is the option of the name tag which makes it easier for the bag to be identified and adds value to the product in the eyes of the custom gift’s recipient. The personalisation of luggage straps can take a few different forms. 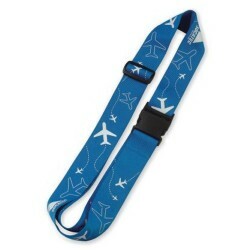 Customers seek to personalise their luggage straps just as they would any other promotional item. A customer may chose to personalise the luggage straps by printing their logo on to the luggage strap. They may opt to screen print their logo or promotional message. For a more lasting effect the customer may go with a sublimated print which is less likely to rub off over time or where they have a gradient in their logo design. 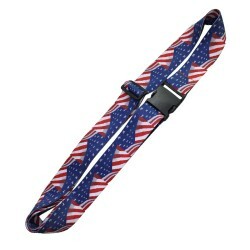 They may even chose to order woven luggage strap which have a more elegant look. Personalise Backing Card – As the name suggests the personalised suitcase strap can be attached to a printed backing card. It is usually attached to the backing card with a plastic strip. The backing card can be printed with the customer logo, promotional message or product data. This option is especially popular in a retail environment and with merchandising. The card can come punched so that the personalised luggage strap can be hung on retail racking. Blister Packaging – This packaging option is also a very popular choice where a customer wants to enhance the personalisation of there suitcase strap. With blister packaging the product is encased in a plastic packaging. The packaging can also accomodate a backing card or sticker with the customer information or promotional material. Blister packaging also lends itself to retail as it is great for displaying the personalised luggage strap. 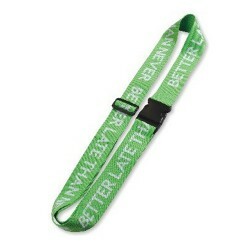 Ezy Lanyards are a premium supplier of branded ID products. We supply customers through Australia with quality products. We also have a full service website supplying a full range or promotional products. If there is anything you need apart from the products you can find on this website then give us a call or visit www.ezypromos.com.au. Our friendly staff are always happy to assist your enquiries.